Walking with Jesus: Day 9: Matthew 4:18-25; Psalm 9 - How Did Jesus Bring the Kingdom? Day 9: Matthew 4:18-25; Psalm 9 - How Did Jesus Bring the Kingdom? How Does Jesus Bring the Kingdom? After Jesus returns from being tested and tried in the desert wilderness and begins His ministry in Galilee, He proclaims that the kingdom of God is at hand. He then calls His first disciples and begins to proclaim, demonstrate and initiate the kingdom through three key means: teaching, preaching and healing. 1. Teaching: Jesus taught the Scriptures in the synagogues, opening and explaining God's word for His people. 2. Gospel Proclamation: Jesus proclaimed "the gospel of the kingdom." We don't know exactly what Jesus said when He proclaimed the gospel, but He preached the Gospel. He told the people of God's love, God's power. their sin, their need for salvation and God's kingdom. He called them to repent of their sins and from trusting in their own righteousness and to turn to the Lord in faith instead. 3. Healing every disease and affliction: Whatever afflicted or oppressed the people, Jesus healed them from it - sickness, paralysis, blindness, demonic oppression, etc. Today, the church is called to bring the kingdom and demonstrate to the world the greatness of our king through these same means. While we do not have Jesus' supernatural power to heal and perform miracles, we can and should teach God's word, preach the Gospel and heal the sick. Clear instruction, authoritative proclamation and loving kingdom demonstration are the ways God continues to show Himself to people and advance His kingdom in the world. Heavenly Father, You have been so richly and wonderfully good to me and I have so many reasons to thank You and praise You. You have drawn me from the darkness of my sin and ignorance into the light of Your righteousness and truth. You have brought me from rebellion and death into son-ship and life in Your gracious presence. You have forgiven my sins and You continually forgive my sins, not for anything I have done but for everything Christ has done. You have given me a new heart, freed from the stony prison of self-worship to truly love and desire to honor You. I rejoice in You and I thank You for such kindness, expressed in every gift of love - every breath, every joy, every pleasure, every glimpse of beauty, every grasping of truth, every day of life. Satan the adversary hurls accsations against me. I turn to You to justify me. If I had to face him on my own, I would be condemned, utterly destroyed, without hope or strength before him. But You have given just judgment by condemning Your Son in my place. 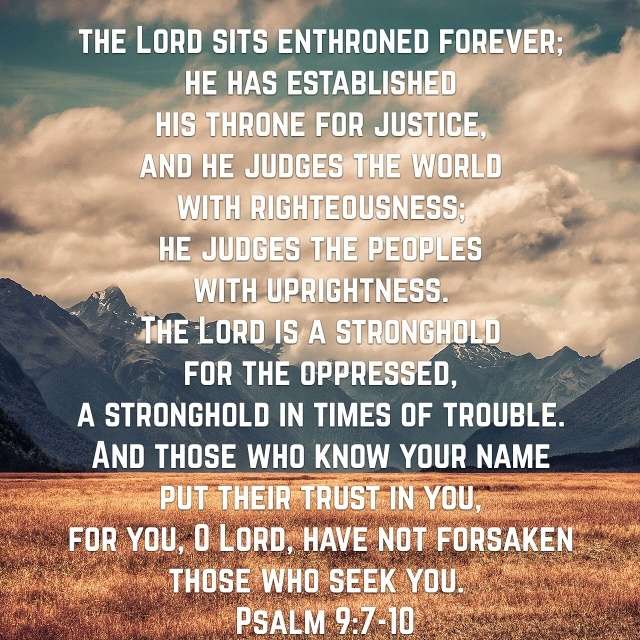 You have justified me by the perfect obedience of Your Son and have silenced by enemies, who now stumble and perish before Your perfect justice. Father, the nations of this world are led astray by the devil into deception and rebellion against You. The nations hate You and resent Your rule over Your world. But You are the King forever. No one can stand against You. 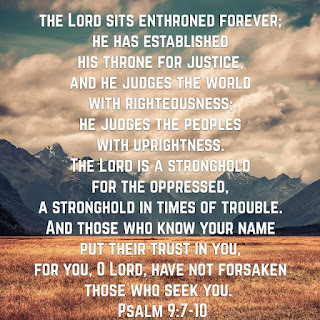 Your throne alone will give the final determination of justice, and the wicked, rebellious rulers of this world will not be able to stand before You. Father, You never forsaken those who seek You and put their trust in You. Please keep all of Your people in Your care. Be their stronghold in times of trouble. Protect those under threat from the wicked powers of this world and under attack from the enemies of our souls. Father, may all of Your people have hearts filled with songs of worship and praise for You, remembering who You are and always rejoicing before You. But we are in danger in this world. The ferocity, intensity and frequency of our temptations and attacks never seems to slacken and we are in danger. Save Your people and be gracious to us, O Lord. Lord, all over the world, Your people are often in the position of being the poor and the oppressed, whether under ISIS or Communist governments or Islamic radicals in Saudi Arabia and Iran or under secularist socialist states. So often Your people are the ones on the margins of society, deprived of resources and influence in the corrupt nations of this world. But You do not forget Your own and You have promised to redeem. You will bring justice and vindication, and so we look for You and ask You to do it. Come quickly, Lord Jesus. Show the nations who You are. Bring a final end to evil. We long to see You face-to-face. Maranatha! Amen!